Homogramineae examines the relationship between man and nature, post the Industrial Revolution. Homogramineae was performed on the street for two weeks, every other day for two three hour periods in downtown Pittsburgh, Pa. The two week run enabled two things to happen. First, two weeks allows the grass bed to age and the repeated weight of the performer creates a contoured form in the grass bed. Second, the regular denizens of the city were able to see the changes occur in the performance/installation on a daily basis. Repeated confrontation with this unusual site in an urban environment allowed the people to become accustomed to the performance and to eventually interact with the performer and installation. 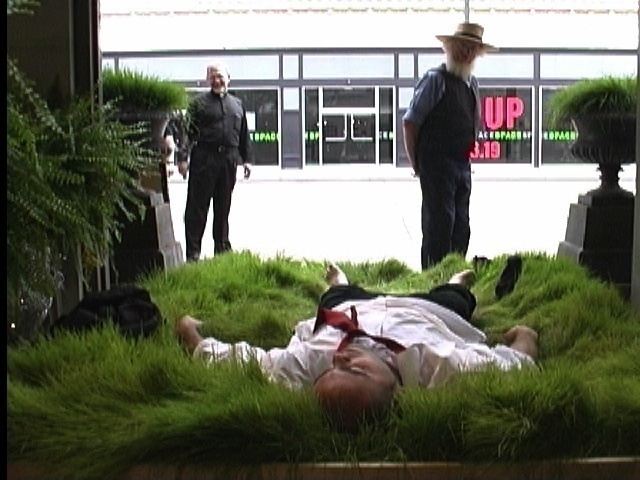 Grass Bed 84"x 50" x 24"